Telescope mirrors can be manufactured solely by hand in outstanding quality! In what follows here, the process of making a 14"- mirror shall be described shortly. Making a grinding- and polishing machine will reduce the invested time and costs per mirror visibly in future. When delivered, the mirror blank should be square on both sides. In the process of Rough Grinding one side gets the the desired sperical curvature using an abrading medium (silicon carbide) and a very simple grinding tool. In this phase the demanded accuracy is comparatively low, the grindig tool is made from a simple granite plate. After many hours of sweaty grinding, the desired sperical curvature has been reached roughly. For measuring the sphere I use a home-made spherometer with an absolute precision of 0.01mm - this is ok for the moment. Following now is the process of fine grinding. Using more and more fine-grained abrading mediums the surface is improved step by step. At the end of this phase, the surface only deviates 0.01 mm from the sphere - it is now milky transparent. After fine grinding, the mirror has to be polished. The tool - made from plaster - is the same as used for fine grinding but now carries a special polishing layer. The polish commonly used is cerium oxide. After hours of polishing, the mirror is now perfectly shiny - but does it alredy show the perfect curvature? After all, the actual surface must not deviate more than 0.00007mm (!) from the demanded spheroid! Is it possible to detect such microscopic deviations from the ideal curve as an amateur? Yes, it is - thanks to a brilliant measurement procedure, found by the physicist Léon Foucault in 1859. As can be seen in the image below, the necessary instrument is quite simple and can be built by the amateur. It is a simple XY transition state. The movement along the optical axis is tracked with a micrometer screw gauge (absolute precision = 0.01mm is sufficient). For recording the measurement image I applied an old zoom lens to a webcam which sends the image to a computer. Having the image on the computer screen offers various signifant advantages when carrying out the measurements - especially if my software VCS - Virtual Couder Screen© is used! Convection flows - e.g. caused by body heat, electric light, computers or heaters etc. may disturb the Foucault test. That is why I constructed a 'tunnel' which shields the lightpath between mirror and tester from the surrounding air. The image shows a view from the tester through the tunnel to the mirror. 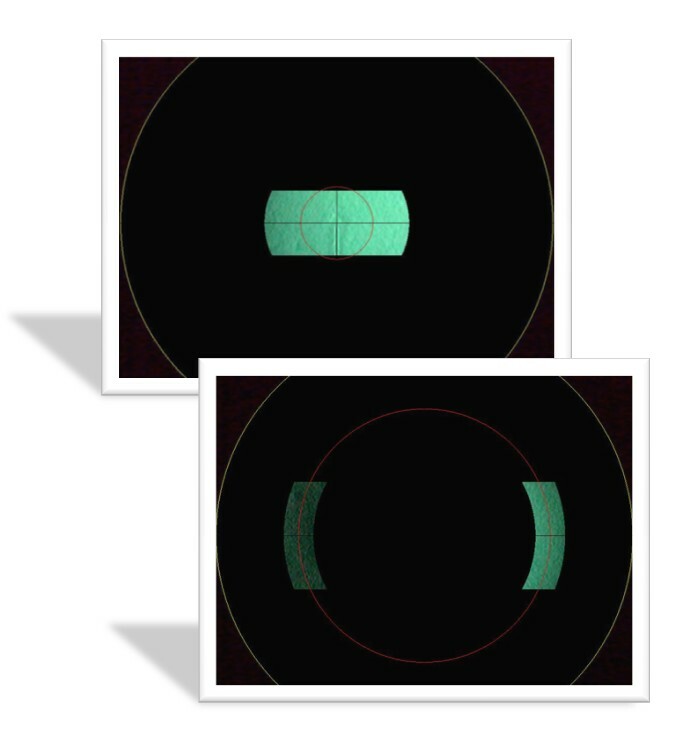 By the way: VCS - Virtual couder screen offers an additional mathematical seeing reduction mechanism! 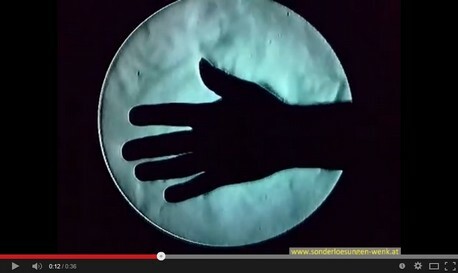 Watch a short video, that impressively demonstrates the sensitivity of Foucault. This is how the mirror looks like when seen through the testing device. Each deviation from the perfect shape is dramatically enlarged axially. 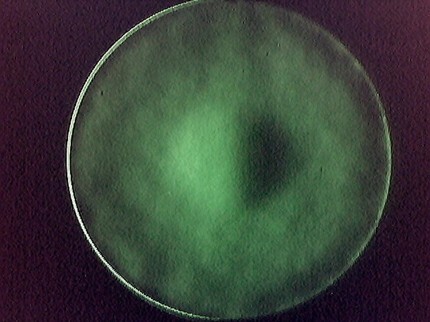 The image was taken in an early stage of polishing; the surface is relatively rough. Actually the central 'hump' is a deviation of only few 1/10,000 mm! The mirror is ready polished as soon as the testing image is seen completely flat without any structure - this sometimes needs a lot of patience - especially with large mirrors. The flat testing image indicates, that the mirror's surface is now a perfect spheroid. As a last step it is necessary to change this spheroid to a paraboloid - only then a 'Newton' delivers really optimal results! The process of parabolising is quite similar to simple polishing though the measuring technique is different in order to get the desired parabula quantitatively and not only qualitatively. A way to achieve this, is hiding the mirror behind so called zone masks that only have apertures for specific and well defined concentric zones. It is then possible to determine the Radius of Curvature (ROC) of the actually 'open' zone. Working through all zones defined, we get a sample of different ROCs that define the actual geometry of the mirror-surface. Parabolising is then nothing else as retouching the mirror again and again until the measured ROCs coincide with the caculated ones. Up till now, the zone masks (zone screens resp.) have always been physical screens placed in front of the mirror which caused some serious problems such as diffraction phenomena, paralaxes etc. The software VCS - Virtual Couder Screen© does not have these problems any more, as it emulates the zone screens virtually on the computer and additionally offers a comfortable way to get the ROCs automatically and objectively. Finally the mirror was coated with Hilux at Orion Optics UK. Compared to standard aluminium coatings, Hilux has additional coating layers that increase reflectivity by 10%.